Payrolls were up 304,000 in the first month of 2019, well ahead of economists' expectations for a gain of about 170,000, and the jobless rate ticked up a tenth to 4 percent. As noted, the uptick in the jobless rate is likely due to the shutdown and should fully reverse next month. The big jobs number for December was revised down significantly, from 312K to 222K, and other revisions to today's report (e.g., a small annual benchmark revision) suggest that we should smooth out the monthly data to better discern the underlying signal. In other words, cue the JB/KB (Kathleen Bryant, who does all the work on this report) monthly smoother! 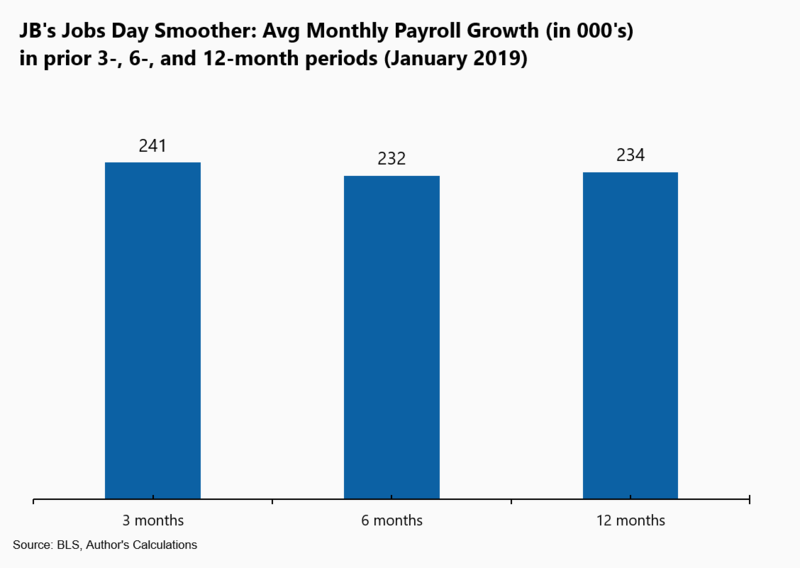 It shows average monthly payroll gains over the past 3 months to be a very robust for this stage of the expansion: 241,000. The other bars, which take monthly averages over longer periods, are around the same height, implying an underlying monthly trend slightly north of 200,000. This is well above what most economists believed sustainable, given estimates of "supply-side constraints," i.e., the size of the available labor pool. Importantly, it appears this constraint is less binding than many thought, meaning there's more room-to-run in the job market, and that we're closing in on, but not yet at, full employment. 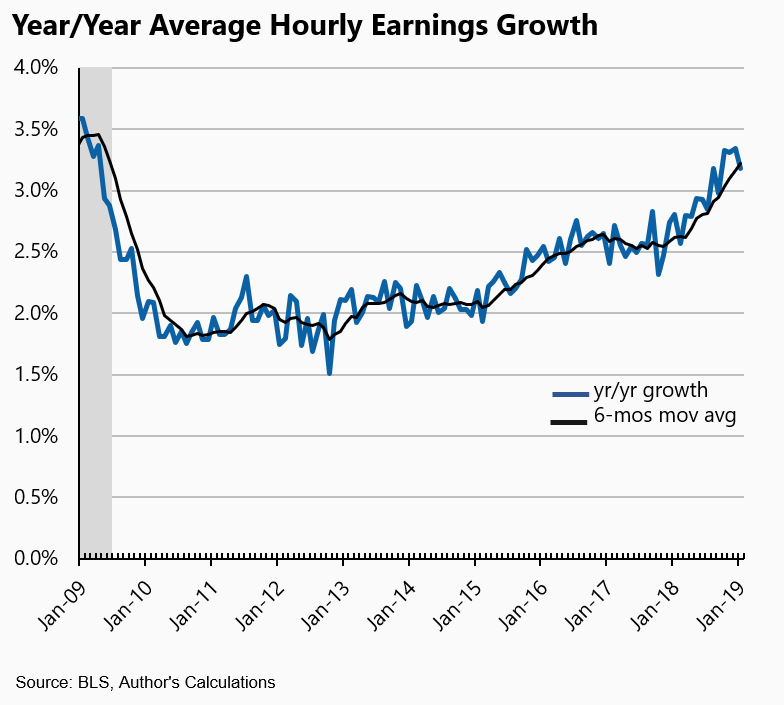 The tight job market continues to generate near-cyclical highs in terms of year-over-year wage gains. Overall private hourly wage growth fell back slightly to 3.2 percent, from 3.3 percent in both November and December. 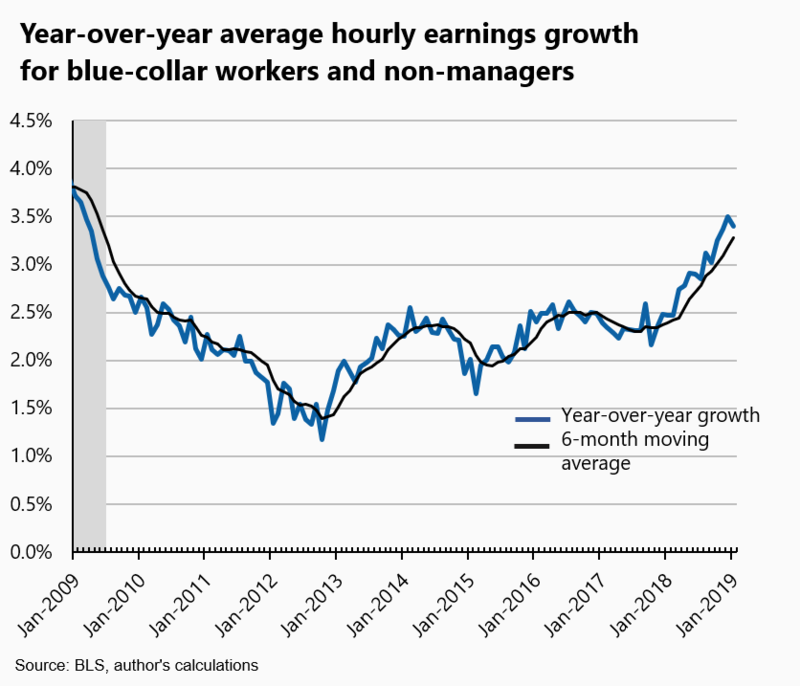 For middle-wage workers–the 80 percent of the workforce in blue-collar or non-managerial jobs–wage growth was 3.4 percent. My estimate for January inflation (the official change does not get released until later this month) is 1.6 percent, driven down by low energy prices. 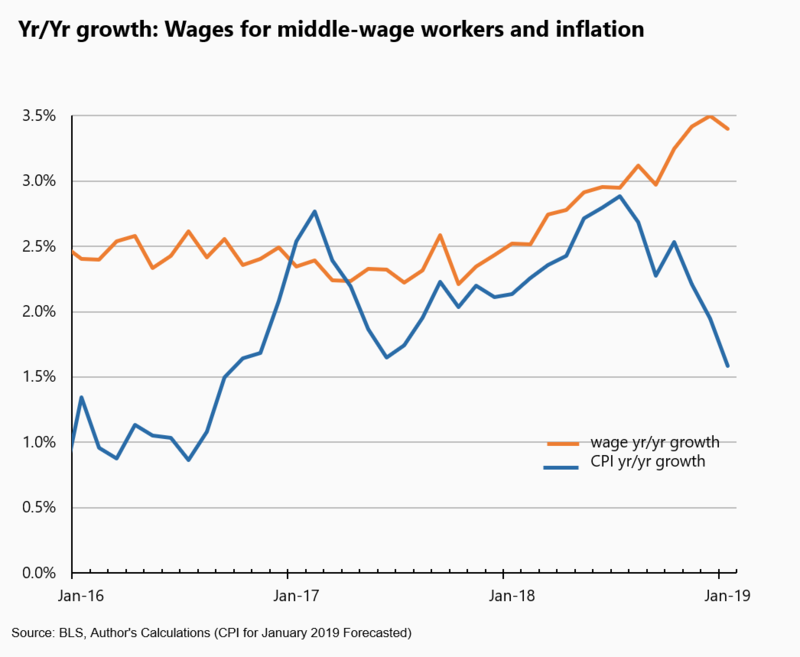 That implies mid-level, real wage gains of 1.8 percent, a solid increase in buying power for these workers, many of whom have long been left behind (of course, we're talking averages here, and we know that even now, significant pockets of labor slack still persist in some places around the country). As noted, the government shutdown is likely playing a small, temporary role in today's report, though mostly in the unemployment rate. In terms of direct impact, the BLS reports that both furloughed and unpaid federal government workers should be counted in the payroll data, though furloughed workers should be counted as temporarily unemployed in the household data, the survey which yields the unemployment rate. Indirect, or spillover effects, such as a private-sector restaurant worker on temporary layoff because she works near a national park that was closed during the shutdown, could also be in play in today's data. That said, the strong topline jobs number underscores the BLS commissioner's statement today: "Our evaluation of the establishment survey data indicates that there were no discernible impacts of the partial federal government shutdown on the January estimates of employment, hours, or earnings." I'll have more to say later about some of the guts of the report, but especially once we remove temporary shutdown effects from some of the household survey indicators, we're left with unequivocal evidence of a few very important facts. First, in an economy with too little worker bargaining power and too much inequality, the benefits of closing in on full employment are powerful and equalizing. And second, Chair Powell and the FOMC were smart to put interest-rate hikes on hold. There's non-inflationary room-to-run in this job market!